Anonymous sale; Palais Dorotheum Kunstabteilung, Vienna, 23 September 1996, lot 67. The painter Joseph Nigg (1782-1863) specialized in flowers and is considered the most outstanding artist in this subject of his time. The present lot, executed when he was 34, is a salient example of his early style. He was employed by the Vienna factory from 1800 until 1843, becoming head of the flower painting department in 1816. Throughout this period the Vienna factory was recognized as the leading factory in this genre. It is rare for a bird to appear in one of his still life compositions. 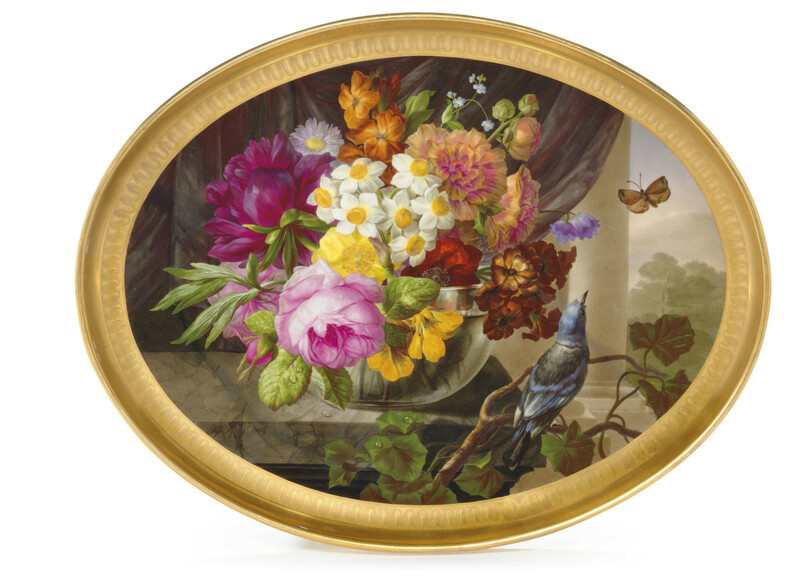 For other examples of Nigg's flower painting on porcelain, see Mrazek and Neuwirth, Wiener Porzellan 1718-1864, Vienna, 1970, no. 720, Farbtafel XVII; also the oval tray dated 1807 offered anonymously, Christie's, London, 18 May 1999, lot 154.